Photos by Jim Schwartz Photography and Amir Marandi Productions. 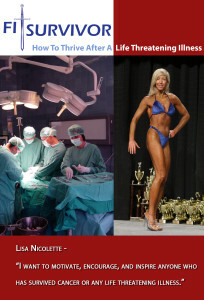 Lisa Nicolette trained, competed and published this motivational eBook during breast cancer treatment with the goal of reaching others. The eBook photo on the left is a motivational tool for those that have faced impossible odds and challenges! There is a story behind the photo of the operating room and fitness competition shot. Lisa stayed on track and eventually competed in the very bodybuilding show that she had to initially cancel for surgery! What are your goals concerning weight loss, fat loss, getting into shape or just wanting a better body and enhanced quality of life? Many people don’t have time for the gym due to demanding work schedules, traffic, personal relationships and busy families! Personal training services available online and in person.